Paul Ajosshi: Does Vegan Food Need More Love? I love animals, especially the cute and fluffy ones, because they usually taste delicious. I have no qualms about roasting rabbits, braising beef, frying fish, poaching pork, sauteeing shrimp and grilling goat. I appreciate meat and I eat it on a regular basis. However, if you include breakfast, over half my meals are vegetarian or vegan in nature. I don't need meat in every meal. I've had many delicious vegetable based dishes in the past and I'm happy to not eat meat if I'm promised something tasty. That's where I stand... On with the incoherent waffling! A friend and I had recently been talking about vegan restaurants and the options available in Seoul. Animal products seem to be everywhere, hiding in stews and sauces in many Korean restaurants. This is a country where ham is not considered to be meat by some chefs and where pleas for an eggless meal may fall upon deaf ears. 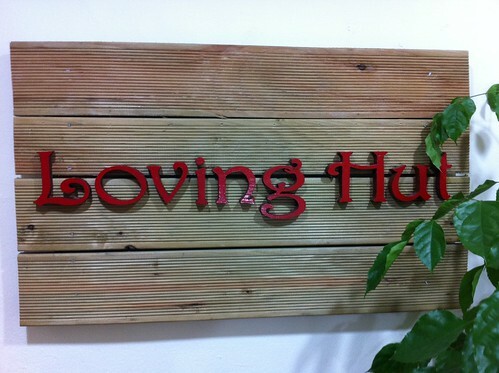 It can be a daunting task for vegans new to Seoul to find places to eat, but one franchise seems to have taken the country by storm: Loving Hut has over forty restaurants in Korea and seems to be a safe haven for those looking for meatless treats. I'd never been to one of their franchises and last weekend I decided to take the plunge and visit the "Honest Loving Hut" in Itaewon. 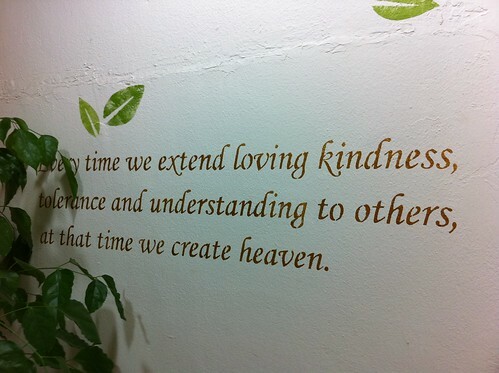 I'd heard about the Itaewon branch through the fabulous Alien's Day Out blog. The photos of the "Roasted Veggie Burger" looked incredible. Could it be that a vegan paradise was just round the corner from my house? First impressions of the restaurant were great, it was filled with happy customers, bright, well decorated, it felt like a nice place to hang out. 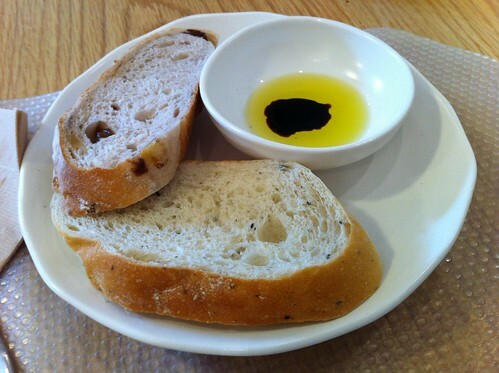 First off, vegan bread with a little olive oil and balsamic vinegar. The crusts lacked crunch, but both slices were flavourful. Then the pasta. Let's take a closer look. I've seen something similar served at Sorrento. 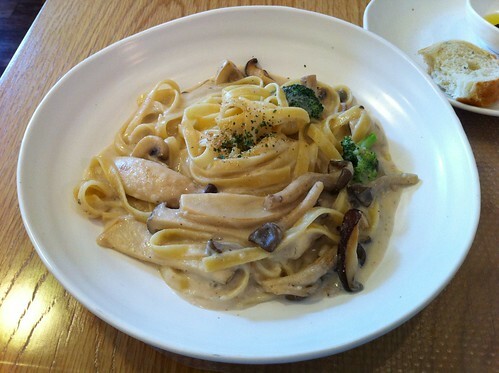 It had the look of a standard Korean Italian restaurant cream pasta dish. Right down to the dried parsley on top. And the taste? Not bad. The "cream" is made with soymilk and manages to replicate a cream sauce, but I'm sorry to say I think Loving Hut can do better. Dried parsley? Really? If I'm eating vegan then I'd like fresh herbs. Vibrant green, chopped, fresh parsley would have done wonders for this dish and could have compensated for the bland cream sauce. If you're not using wine or cheese or meat to flavour the soymilk cream then you need to find other options to make the dish exciting. Roasted onions? A little lemon peel? Maybe some fried garlic slices or enoki on top? Just browning the mushrooms a little more would have added to the flavour of the pasta. There are many ways to improve this kind of meal without resorting to animal products. 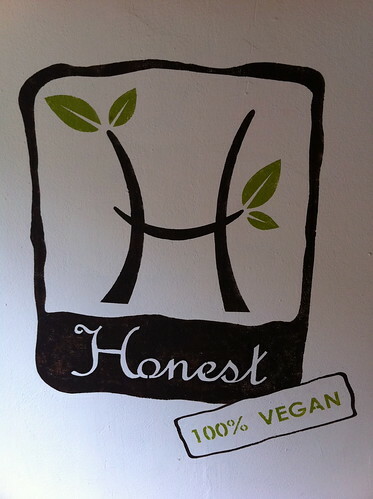 I really want to love Loving Hut Honest... if you want to try their vegan wares then head down to Itaewon station, walk towards Noksapyeong and turn right at the first set of traffic lights you reach. Walk past OKitchen and Michot Bakery, Loving Hut Honest is on the left hand side directly above Chili King. You can call them on 02 795 2111. 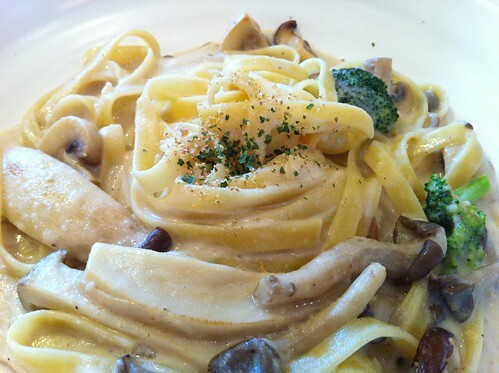 Click here for a fantastic map of vegetarian restaurants in Korea. Dried parsley!!??? NO!! If there was only one of these places I reckon you'd get more love, Paul. But since its a franchise I guess you're stuck with the Italian Plate mentality!